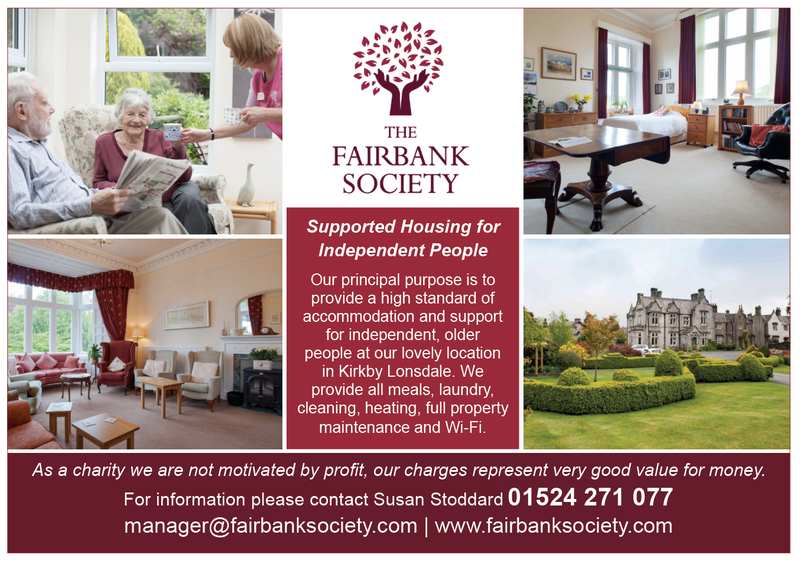 Set in the delightful south Cumbrian market town of Kirkby Lonsdale the Fairbank Society provides quality accommodation and support for independent, older people. Once a year they open their doors for a delicious Strawberry Tea. Features Writer Rob Bullock discovers more. Everything is on your doorstep in the popular market town of Kirkby Lonsdale, shops, services and beautiful countryside and the beautiful, high-quality accommodation at the Fairbank Society. They have a variety of places to live including cottages, apartments and en-suite rooms, which offer older people the opportunity to retain their independence while at the same time enjoying meals, laundry, room cleaning, heating, full property maintenance and Wi-Fi access. There are various types of accommodation on site, two cottages, five apartments and sixteen en-suite rooms of different sizes. The site has two beautiful main houses, The Gables and Travers House, which are set in stunning fully maintained gardens with views of the surrounding fells. Residents can access and enjoy all areas of the grounds. There is a guest bedroom available for overnight stays by residents’ families or friends for a nominal charge, and they can also provide accommodation for short term support, for example for convalescence or carers’ holidays. Because the Fairbank Society is a registered charity and is overseen by a board of Trustees their principal purpose is to provide a high standard of accommodation and support for those people lucky enough to live there. Manager, Susan, who lives on site, has a team of employed local professional staff, both full time and part time which collectively provides the highest standard of service and support in line with the Society’s values and commitment to their residents. The Fairbank Society tries to bring the wider community into the houses for residents who are not able to get out much. They have volunteers who call for coffee in a morning, they have two or three young people who are employed as junior assistants, they actively encourage students on Duke of Edinburgh Award Courses to volunteer, and they have in the past been involved with work experience. The Fairbank Society offers a 24-hour call system by their own staff who sleep on the premises while on duty. The staff all have first aid training and will help in the event of minor ailments or emergencies. If over time, a resident requires some form of care-based support, then they can employ carers as they would in their own home. “The idea of the Strawberry Tea is to allow people to look round in an informal setting both inside the houses and the grounds, to meet residents, staff and trustees and chat and experience life at the Fairbank Society. This is the only yearly open event in our calendar. It is also our chance to say thank you to the local community for their on-going support.” Lots going on There are frequent activities and outings for residents with the support of staff, trustees and volunteers. These take the form of weekly dominoes, weekly exercise classes in both houses, monthly film afternoons and picnic excursions to various places in the Lakes and Yorkshire Dales.